Spreading LRT stops too far apart - up to 1.5 km - will undermine both ridership growth and economic uplift. After reviewing the basic alignment and stop locations for Hamilton's Light Rail Transit (LRT) line, I have some serious concerns about the wide spacing between stops. In early planning, the idea was to have stops spaced at 600-800 metres as a compromise between convenience and speed of service. This is already quite widely spaced compared with other systems. For example, Grenoble's average spacing is about 500 metres, as are Toronto's surface LRT stops for the Eglinton Crosstown. However, the released design shows some stops extremely far apart. The Longwood and McMaster stops are 1.5 kilometres apart, the Scott Park and Ottawa Street stops are 1.4 kilometres apart, and the Queen and Dundurn stops are about 900 metres apart. These stops are just too far apart for an LRT line that runs entirely through dense urban neighbourhoods (with the exception of the Highway 403 crossing). Most urban LRT lines have stops spaced at 400-500 metres. The only exceptions are lines that include underground stations and sections that run through undeveloped, suburban or rural sections. I can't think of a good reason to space urban LRT stops 900-1,500 metres apart. At 1,500 metres - that's 1.5 kilometres - a would-be transit rider might need to walk up to ten minutes just to reach a station, even if they are already on Main Street. Most subway systems have stops spaced more closely than 1.5 kilometres! The Paris Metro system has stations every 500-800 metres. Since most people will not walk more than about 400 metres to reach transit, this will significantly decrease the attractiveness of LRT as a transit choice. And since most development occurs within 400 metres of the stops, this will also decrease the economic uplift. There will simply be less real estate to develop within the walkable radius of the LRT stations. I assume that the stop locations were influenced by the current B-line express bus stops, but it should be remembered that transit riders currently have many local bus alternatives - e.g. 1, 5, 51 - with stops every couple of blocks. These local Main/King lines will disappear or be curtailed once the LRT is in service. We are also already seeing disappointment from previously supportive businesses when they learn that the nearest stop will be far from their business. This is glaringly the case through the International Village, where there are no stops between Catharine and Victoria, a distance of 750 metres. The International Village can't serve as a high quality urban transit mall with only one lane of motor vehicle traffic if it doesn't actually have transit access! There should be a station somewhere in the vicinity of Ferguson Avenue. I urge Metrolinx and the City's LRT office to add more stations so that no stops are more than 800 metres apart, and most are significantly less than that. The city should be considering a more urban LRT design with many spacings closer to 400-500 metres. Remember that an important goal of LRT is to drive significant intensification and economic development. We must build LRT for the densities we would like to see, not the densities that exist today. This is the public consultation phase of the LRT design process, so there is still plenty of time and opportunity to optimize the design and fix any bugs. The routing strikes me as basically the HSR's B-Line Express writ large. Transit planners are unanimous: Nobody lives or works in Westdale. BTW, seeing as they've gone from 15 to 13 stops in the first round of revisions, what would it take to double the number of stops? I don't think they should double the number of stops, but they should consider adding four or five in underserved or dense areas. Note that Grenoble's line B is 10.5km and has 22 stations, so we would still be quite a bit more widely spaced with 17 stops over 11 km. Their latest line E, which serves distant suburban areas, is 11.7km long and has 17 stations. Speed is important (it should be significantly faster than the buses), but much of the speed gain over buses comes from signal priority and dedicated rights of way. And we are thinking of the speed advantage not just now, but in 20-30 years when Hamilton is a much denser city with a bigger population (especially along the line). Cline fills in the 1.5 km gap (and would prepare for future intensification), while the others are all major destinations and fill in large gaps. Gage Park is a very important stop. Scott and Ottawa are too far. This year, plan to press hard on advocacy with a major push for an International Village stop, as well as Gage Park. Gage Park is growing in popularity again after low times and events are happening more. With future enhanced escarpment access at Gage Park (e.g. gondola), the numbers of people using Gage Park would go up if there was a Gage Park stop at Delta. Yes, it might be fairly close to Ottawa, but LRVs have to slow down anyway when turning at Delta, so adding a stop there will not significantly slow crosstown service. Adding four more stops as outlined makes lot of sense. Adding those four stations would give an average distance between stations of around 700m which is still much more than most systems and seems like a better compromise between speed and convenience. It is also consistent with the original design goal of having stops spaced between 600-800m. The current design gives an average spacing of about 900m, which makes the statement in the presentation that "the majority of the stops are between 600-800m" a bit misleading. I completely agree that International Village needs a stop. It's crazy to think they wouldn't get a boost in pedestrian traffic in exchange for shutting down automotive traffic. That said, I don't support doubling the number of stops. For LRT to work, it has to be more than a bus route for those that have no options. It has to perform better than driving along the same route to really attract ridership. That means keeping the average speed up around 30 kph. I agree with reducing the space between LRT stops. There are many people with disabilities and persons who are elderly who have difficulty walking who will be using this system. Let's ensure that the system makes it easy for them as well as others to get around this city. And by all means - let's have a stop at International Village. Suggestion: how about having a stop at Gage Park? As per the current design, those who wish to attend events and festivals at the Park or simply enjoy its beauty will have to walk back several blocks to get to it. How much does an LRT stop cost to build I wonder? I agree there should at least be one in the IV proper. If they are going to cut off car traffic they should replace it with something. It appears that when the business case was submitted to Metrolinx, the cost per stop was $625,000. That figure is a few years old now but at least it's an approximation. I agree with respect to international village. One more stop at Ferguson would be nice. It would be fitting given the rail history of that location and the Ferguson St station could be somehow integrated into a tourist info centre or something to tie in the theme. It would also give a stop at a grocery store (Deningers) and, of course, other local businesses. looking at distance between some of the stops and the proposition that people should pay more for LRT than bus service gives me some discomfort. sometimes it feels like the routes greatest function is getting people to the go station to leave the city. the lack of a stop in the international village is pretty sad and i would be very empathetic towards business owners in that area who are opposed to it's construction. Is anyone proposing this? I thought the system was supposed to be totally integrated with the HSR. Hopefully adding extra stops to Cline, Bay, Wellington, and Gage will increase the costs enough to scrap the A-Line until a later phase. When it can be designed properly, you know with public consultation. This is the public consultation phase: the released designs are preliminary and subject to revision based on the consultation. Could certainly use an Eastgate Square stop. Is it reasonable to think that the number of stops could increase over time as development along the route leads to higher ridership and more frequent service? Allowing the expected uplift to start with the current stops and in filling later? I was thinking this too --- if the plan is to add stations later, then a longer stop spacing makes some sense. If stations are 6-700 m apart then adding stations in between would make the spacing too short and would likely increase travel times. However, it doesn't make sense to leave the International Village for some other phase - it should be properly served from day one, since it is supposed to be a transit mall. It also doesn't make sense to me why, if it is the case that additional stops are planned for later on, the plan does not make mention of these future additions or show preliminary locations. That makes sense for some areas, but 800m should really be about the maximum given typical walking distances (except between Dundurn and Longwood where the LRT crosses the 403). As densities increase, the spacing might be brought down to a more typical 500m separation in some areas. But I would argue that the four extra stops I listed are justified right now given either the very large spacing (> 1km) or high density (like International Village). How about a stop between Spring and Jarvis? With parking lots on either side of King they could make room for a lane of traffic and lrt stop. Yes. Jarvis would work as well. great idea. I've long wished that 'Jarvis Square' was actually a public square. This would be the chance to do it. A nice pedestrian plaza adjacent to a new LRT station. I've always kind of wished it would follow the old King tracks through westdale. The westdale village has those North/South parking lot legs to bypass around a streetcar platform in the middle. Reduce the inner angle-parking to regular parallel parking to keep the room and make the core of the westdale village an LRT station. Of course, hard part is what happens when the train gets to Mac. I mean, if King alignment is good for downtown, why not westdale? It's more central, like 90% of the neighborhood lies North of Main. Of course, Westdale King is probably too narrow, I assume it's on Main through westdale for a good reason. This has really been confusing me. I agree with your plan, perhaps with Cline, Haddon, or Dalewood providing a link to Main. Though perhaps that link to main is the part that scared them off. If that's the case, can anyone explain why the current plan is to build a giant bridge across the 403 instead of using Paradise? It seems insane to me to basically avoid a business hub and the entire neighbourhood around it. Doesn't Main make more sense from the perspective of linking bus and future expansions to Dundas / Ancaster? Like I said, hard part is what happens when you get to Mac. Hook right around the hospital? Spend Xillion dollars to tunnel under it? Or barrel down a 2-lane residential road to get to Main? And the university is already cranky about how the vibrations from Main will affect their sensitive scientific equipment, so I imagine plunging through campus and returning to main via Cootes Drive isn't really an option. Not sure why you would need to hook around? I thought this was a 2 track LRT with crossover on each end. No loops. Looks like it is proposed to stop in front of hospital. Well, for one thing the bus terminal/exchange thing is at the other end of the hospital. For another, the long-term (decades off) plan is to go to Dundas. Main was really the only practical option - I mean, if you ran it down Haddon to get from King to Main you'd probably need to chew a lane off of everybody's front lawns and leave 4 houses without driveways. This is definitely a good point. Any idea why they're looking at a new bridge instead of using Paradise then? I keep on coming back to that spot and I haven't been able to make sense of it. Perhaps weight? But then LRTs weigh around the same as a fully-loaded semi. This is the kind of concern and discussion that should be happening around LRT. Not the Main street-don't need it-mountain absence tripe we are hearing now. Thanks for another piece of thoughtful input, based on data, regarding the LRT. In addition to discussions on additional stops, the proposed route itself should be up for discussion. Reports show current annual operating costs of B-line bus is $22 million to the QTC. LRT to QTC will be $16 million, however rerouting buses will cost an additional $17 million per year. Total annual operating costs (borne by the taxpayers) estimated at $33 million per year. In comparison, current annual operating costs of B-line all the way to Eastgate is currently $27 million. Annual operating costs for LRT would be $22 million ($5 million per year less than current bus system). The other buses that feed Eastgate are mostly area rated to the other areas so shouldn't be as much of a concern to old city taxpayers. We need more transparent information that shows clearly what the on-going costs will be to the taxpayers before any final decisions are made on the route. I think you got the figures from Appendix A of the Rapid Ready report. It's important to point out that the $33 million cost is not the "cost to taxpayers" (unless you're including fares as a cost to taxpayers), but the gross operating costs. In fact, the total revenue is projected to be $29.2 million (p 20 of Appendix A), so the net cost to "taxpayers" is only $3.7 million: not very much at all. It could easily be a net profit if ridership is higher. The potential problem for HSR is if Metrolinx doesn't share the revenue from the LRT. Without revenue from King/Main lines the HSR would be much more expensive to operate. However, Hamilton could also use LRT as an opportunity to grow HSR ridership, which would lower the cost of HSR to taxpayers. Actually what I did is assumed no growth in ridership for LRT and no increase in operating costs for the buses. The picture as it stands right now to show the current costs. $2.93 / trip on the bus x 7.4 million to QTC = $21,682,000 per year $2.93/trip on the bus x 9.2 million to Eastgate = $26,956,000 per year. I was attempting to show the naysayers that LRT is less costly (more sustainable) even if ridership stays exactly the same and operating costs do not go up at all. I think most people who don't use public transit are opposing LRT because they think it will cost them more as a taxpayer. I also was attempting to show that Ward 5, and others even in Wards 1 - 4 should be advocating for the route to go to Eastgate! It will cost every taxpayer less if the route is extended. Ward 5 isn't dodging a bullet; they're adding costs to their own and everyone's property taxes. But $2.93 is the gross operating cost on the bus (about 50% is recovered from the fare box). It sounded like you were trying to estimate costs to taxpayers, not gross operating costs. Extending to Eastgate could have been paid by the Province and the route would have generated almost $5 million in net operating profits. The original Eastgate to McMaster line was predicted to make a 19% operating profit (compared to an 11% operating deficiency for the McMaster to Queenston option). Wooo - you added a line! ending at Queenston is going to run at a deficit???? Thank you for this! I'll read through it. While I personally believe ridership will/should increase, the silent majority find it too easy to poke holes in growth predictions and estimated profits. If it's true that the annual cost of lrt is less than our current bline bus, then that is likely all that needs to be said to convince the majority of residents. All the other advantages are the icing on the top! That's right: cost recovery is predicted to be 89% (still excellent) taking into account running both LRT and the buses. I think everyone agrees that continuing to Eastgate would have been the ideal solution but its hard politically when the ward councillor was adamantly opposed and the Province wanted to connect to West Harbour. The predictions for ridership are, however, very conservative. Note again that overall cost recovery on HSR is only 50% and most transit systems run at something like 35% cost recovery. The push to have it go to Eastgate has to come now! Front Page Stoney Creek News yesterday, new plans for that corridor do NOT include LRT. It includes BRT so we will never get to the 19% profit predicted. As far as I know, the extension of LRT to Eastgate is still planned as a second phase. This is what is shown on the alignment plan released just last week. I agree that it would be great to have a grass roots push from Stoney Creek and Ward 5 residents to demand the extension to Eastgate now. Who do I call for advice on initiating grass roots push? 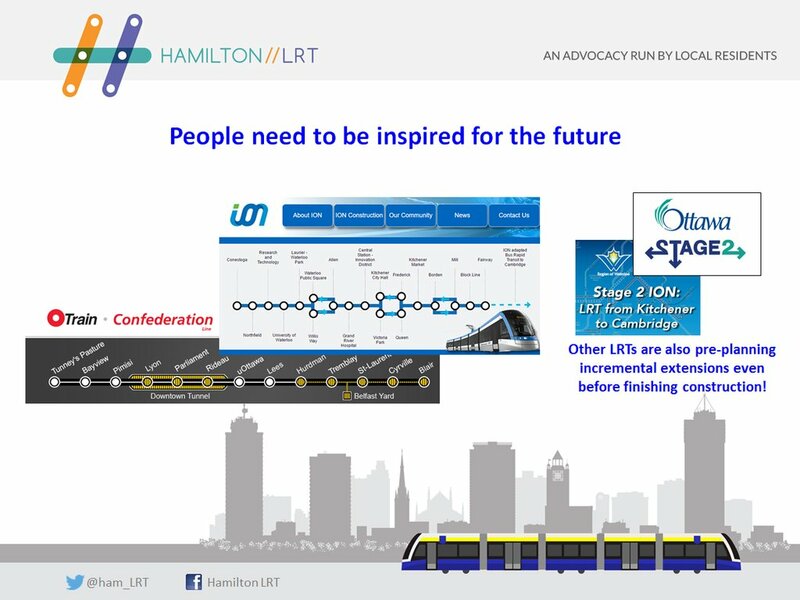 We are one of the biggest active local LRT advocacy group, also working with members of the original hamiltonlightrail.ca group too and many other new members. Nicholas Kevlahan, the author of this article, also attends our advocacy team meetings as well. Almost a thousand follow us on our social media, after only barely beyond six months of having started up. We definitely advocate quick incremental extensions, including being patient until nearer 2018 or 2022 elections due to unfavourable politics in Stoney Creek. Those politics can could end up sabotaging the rest of the LRT if people try to blindly grassroots-push too quickly into Stoney Creek -- it needs thoughtfulness and respect to their electorate -- That said, it likely will take a few years before voters change their mind. When the electorate feels like they are missing out, they will eventually turn around and vote for the LRT. Especially if Ottawa and Kitchener-Waterloo (opens by 2018) show tremendous success. We are observing very quick incremental extensions in both Ottawa and Kitchener-Waterloo occuring, becoming funded even before they finish construction of Phase 1. Stage 2 will change the way we move around Ottawa. Think about it: 30 kilometres of rail and 19 new stations. That means shorter commutes, cleaner air, and a stronger economy. You will be able to get on a train as far east as Place d’Orléans, travel traffic-free through the downtown tunnel, and arrive as far west as Bayshore or Algonquin College. If you’re coming from the south, Stage 2 will extend the existing O-Train Trillium Line to Riverside South, while adding stations along the way at Walkley and Gladstone. ...and their Stage 1 is still under construction! Ottawa approved Stage 2 five years before the scheduled completion of Stage 1, to achieve contiguous construction. 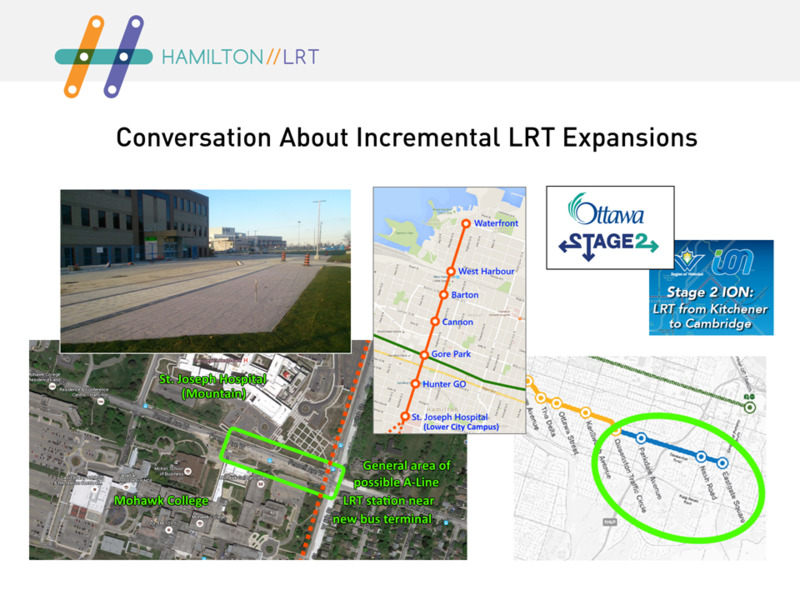 Hamilton's equivalent will be getting Stage 2 approved shortly after a favorable 2018 election, and barring that, another opportunity during 2022. We must advocate this. At the same time many of us feel it is a mistake is to panic about a "build and forget" mentality. Yes, I know, "Hamilton" and our well known defeatist mentality, but we are not Toronto -- and many opportunities of funding pitch-ins will occur between now and 2024 and the politicking that goes with all of this. This is what we are aiming for: advocating for quick incremental extensions, beginning Phase 2 construction right after Phase 1 when the electorate in Stoney Creek generally warms up to it. This can potentially include grassroots campaigns to convince Stoney Creek electorate to vote for LRT. Many parts of Kitchener-Waterloo, despite complaints about construction, and some cooling off on LRT, many have warmed up to the LRT too. There are also many who wished they did not vote against the LRT and now want Phase 2 to be accelerated. Many of us WILL do a strong push. Many independently, many within our advocacy, and/or other groups. But many are also are observing other cities, and realize we should wait a small bit (on certain Eastgate advocacy elements) for all the above reasons. But it is never too early to begin talking to residents near Eastgate/Stoney Creek -- at least residents willing to listen now well before the benefits of LRT becomes more obvious/visible. Huh? This is completely disingenuous to bring this argument up now. The LRT mirroring the B-Line was plan from way back in 2009 and 2010. That was the plan when "what's her name" who ran the LRT office before leaving for Niagara Region was running the dog and pony show. Just wait until the general public realize that buses will still need to run in parallel to the LRT, as they do now with the B-Line. Sure add a Gage Street stop, but the Delta is too close to Ottawa for a Gage Park stop. If you want Gage Park lobby for the LRT to run along Main Street. It always perplexed me why the B-line didn't have a stop at Wellington, but Matthew Green shared with me during the last election that fact/"issue" didn't even register with First Place residents. They could care less about the B-line, so the main driver for a Wellington Street stop is gone.